new years day in london i went to parliament square. i was glad to see brian haw and his supporters still making their protest about the killing - particularly of children - in iraq and elsewhere, although it's shameful that he still needs to be making this protest because the killing goes on. apart from them, the centre of the square was being kept empty (or 'sterile' as the police like to say) for the westminster new year parade, though a helpful policeman did let me go across to take a few pictures. brian was taking pictures too, as well as getting some placards with a message for the passing parade ready. i took a few photographs, including the pink christmas tree. this had been made to take to 10 downing st, but they decided to keep it in parliament square as it would only have been thrown away at once by tony blair's staff. then i left the real world. 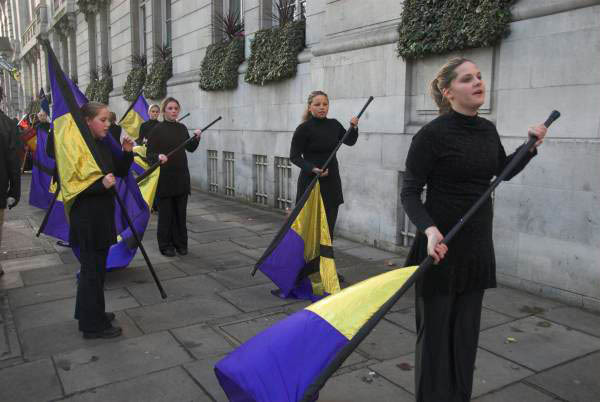 the london new new year parade is almost entirely an exercise in unreality, and is still dominated by american school marching bands and cheerleaders, although a number of london boroughs and other organisations now take part, and provide the major visual interest. 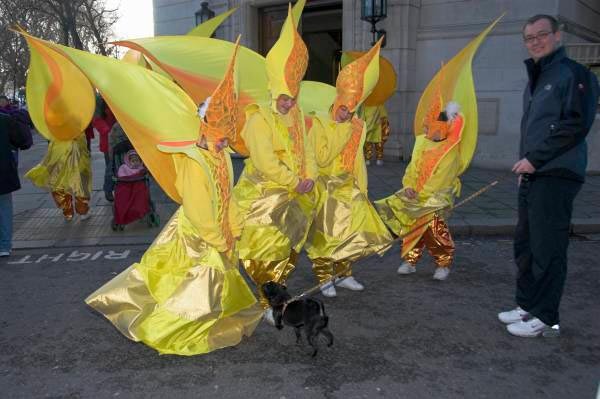 started in 1987 as 'the lord mayor of westminster's big parade', it is now officially known as 'the new year's day parade - london'. it does raise money for charities, including those in the boroughs that take part, and is also used by various organisations to raise their profile. perhaps the most effective of these is falun gong. apparently last year the parade was seen by 220 million people worldwide during a 3 hour live tv broadcast. 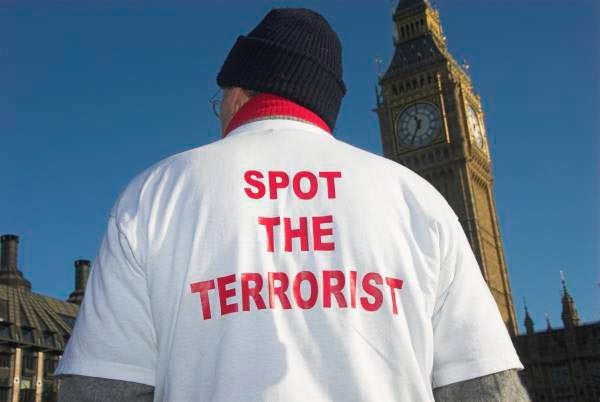 lets hope they get to see the message from parliament square, although i expect it was censored out of the coverage. it is an event that has its fascinating, if not surreal, side, although those watching on the sidelines or on tv will largely miss this. i hope that this aspect comes over in some of my pictures. it was a brilliant sunny winter's day, which was an advantage for those taking part, although it was still chilly, but the bright low sun made photography more than difficult, showing up the inadequacy of lenshoods in most situations. on my way to and from the parade i walked by the thames and took a few pictures. it's interesting to see the complete difference between the views of battersea power station along the river in the morning and afternoon light. preparations for the london olympics in 2012 are gathering pace, and i found several of the places i'd hoped to visit on a trip to the stratford area were now fenced off. what a pity nobody had the nous to deal with london's two major environmental threats with one stone by siting the olympics at heathrow! it would have been an ideal site, destroyed long ago, but largely empty, with reasonable transport links, and would have reduced the huge pollution that areas around the airport currently suffer. probably even terminal 5 could have been put to sensible use, rather than just being a mega shopping centre for a captive audience; how long before the check in time is measured in days to make sure people spend spend spend? i talked to one of the residents of clays lane, soon to be evicted to make way for the olympics. he talked of living in a fascist state, with lack of consultation and individual powerlessness, and of the games as having always had a militaristic overtone. hardly surprising there is little support for the games here, as inital promises that people from the clays lane housing co-operative would be rehoused in conditions "as good as, if not better than" their present estate were soon changed to "at least as good as in so far as is reasonably practicable." the tenants are expected to be moved out by the middle of the year, though to where isn't yet clear. it does seem that wherever they do move, rents wil be at 2-3 time there current level. 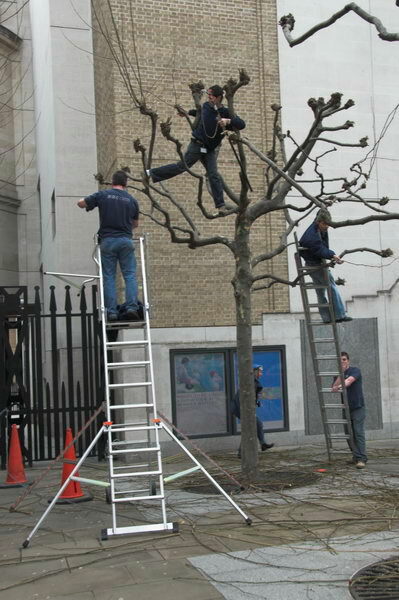 at the public enquiry, the olympic development agency were not even clear why they wanted the site. students were evicted from the neighbouring park village estate last summer, and these houses and flats are expected to remain empty until possible redevelopment in 2008, despite a desperate shortage of housing for students and others in the area. it was sad to see the cycle track fenced off and out of use (i though about taking my brompton through a gap in the fence, but wasn't sure i could get out at the other end), and the bully woods site now occupied by murphy. again, the eastway cycle track was originally to be given another local site, but is now to have to relocate miles away in enfield, so long as the newts there don't mind. parliament smooths the way for the olympic delivery authority at the expense of people and environment, enabling them to slough off the inconvenience of democracy and justice. the situation for some of the local people - particularly those living in clays lane - can only be described as kafkaesque. locally, development was taking place before the olympics, led by the developers 'stratford city'. 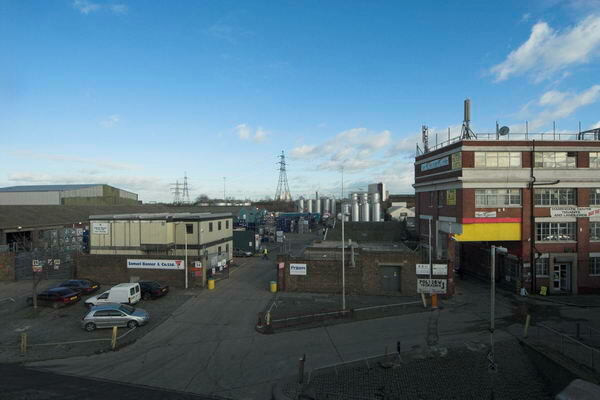 they have lost parts of their planned development - including the clay's lane site - to the olympics. it seems likely that the games, far from regenerating the area will actually hold up the development that would have followed from the completion of the channel tunnel rail link and the new stratford international station. most of the bow back river footpaths were fenced off for one reason or another, all part of the olympic juggernaut, although some of the current closures claim to be temporary. the first closures took place over a year ago. in hackney wick i returned to photograph the footbridge to 'fish island' or old ford next to the lea navigation, a brilliant red circle supporting it. ate my sandwiches in a suntrap by the lock on the hertford union, warm in a sheltered spot, then on to the northern outfall sewer and the lea navigation, and back to the sewer on stratford high road. to my surprise, the gate to the footpath by the waterworks river was open, having been locked for a couple of years. odd, because the only exit at the end of the path was permanently fenced off over a year ago, and is still blocked. i took advantage of it and made a short walk as far as bridgewater road before returning, hampered by the trees that have grown across the path in the years it has been closed. 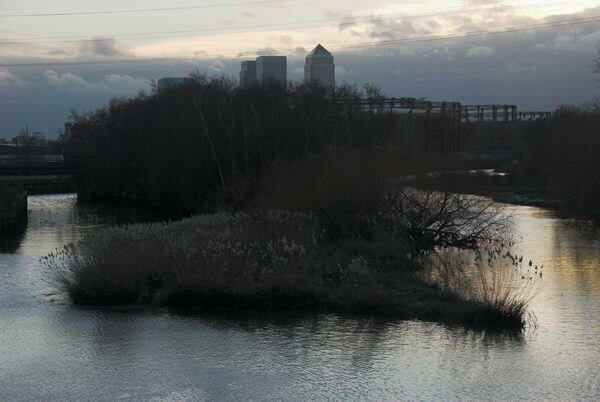 i rode on along the outfall past abbey mill to west ham, then down to canning town and leamouth. the path by bow creek leading to canning town station remains closed, ridiculous after so many years, and i continued along beside the creek and over the lower lea crossing for another look at the demolition on the pura foods site then back to canning town for the underground to waterloo. orange seems to be a colour fatally linked to america's disgrace in the modern world through human rights and related abuses. agent orange spread dioxin-related birth defects over the vast tracts of south-east asia it was used to defoliate, and orange boiler-suits have become the symbol of the fatal american own goal in the fight for freedom, the illegal prison camp at guantanamo bay. amnesty international market the fifth anniversary of this blot on the free world with a world-wide series of protests, in new york, tokyo, rome, madrid, tunis, tel aviv and london. i entered grosvenor square to see a long line of around three hundred people in orange boiler-suits spreading a quarter of the way around the large square. they were soon formed into groups and marched by those dressed as camp guards into a small pen in the road directly in front of the us embassy. in a re-creation of the guantanamo bay camp more or less on the embassy doorstep, the 'guards' patrolled, issuing arbitrary orders and generally abusing the prisoners, subjecting them to the infamous kneeling 'submission posture' with the occasional incident of casual 'violence' thrown in for greater authenticity. the hour-long vigil there ended with a display of defiance as the 'prisoners' joined together in clapping. other amnesty supporters held placards and banners calling for an end to the travesty of justice at guantanamo bay and other illegal detention centres and illegal rendition of prisioners. 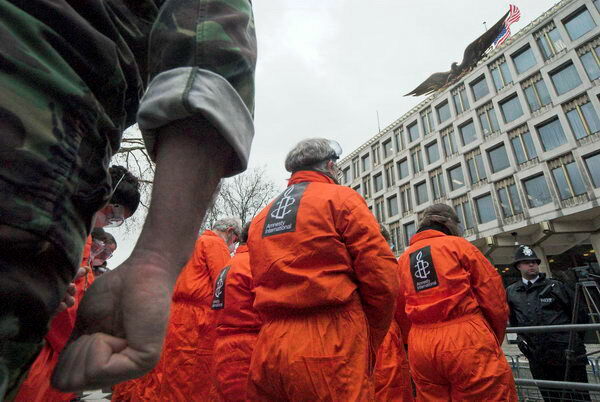 they called for the release of all those held illegally, and in particular the british residents still in guantanamo. these include omar deghayes, whose sister amani deghayes was present at the demonstrations. the lack of any effort by the uk government to press for the release of these british residents is a continuing and senseless disgrace. this was a high-profile media event, although i didn't hear it mentioned on the bbc radio news later in the day, press and tv from london and abroad were covering it. unlike some earlier events i've covered at the same location, the policing was a model of good practice, allowing the press to get on with the job, and proportionate to what was happening. the russian winter festival in trafalgar square was too organised for my taste - fantastically professional performances, but not a great deal of audience participation. and the beer was at truly ridiculous prices, though it would need to be extremely cheap before i'd drink it. there was father frost giving out sweets to the kids, but not a lot else happening off stage. i suppose it was a free concert, but one where you had to stand and didn't get a great view of the stage from anywhere. i photographed a couple of chelsea pensioners watching the dancers on the big screen, along with some of those from the north russia club wearing their wartime medals. but there was really not a lot happening on the square. the first year we had a festival, there was rather more happening. so the singing monks i heard were pretty amazing, but the sound system only adequate. the 'gzhel' moscow state academic theatre of dance were great, but you could only really see them on the tv screens. i took a few pictures of the dancers waiting to go on, but soon decided i had better things to do elsewhere. 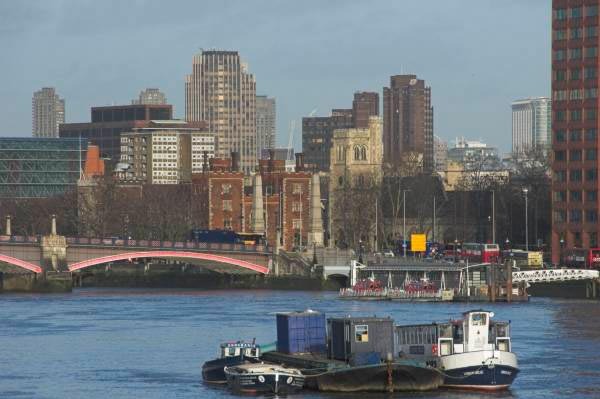 the annual blessing of the waters ceremony which he saw in the orthodox churches of serbia impressed fr Philip Warner when he was appointed to the city church of st magnus the martyr at the northern foot of old london bridge, he decided to bring the ceremony to the river thames. his parish meets that of southwark cathedral at the centre of the river, and the two congregations have met annually at the middle of london bridge since 2004.
after the morning service at southwark cathedral a procession of clergy and congregation made its way onto london bridge to meet those from the neighbouring parish. there was then a short service led by the bishop of woolwich, rt revd christopher chessun, during which prayers were said for all those who work on the river and in particular for those killed close to this point in the 1989 sinking of the marchioness. the bishop then threw a wooden cross over the side of the bridge into the water (fortunately there wasn't a boat passing underneath at the time) and finally sprinkled those present with water, although this was probably not straight out of the thames. the congregations then went off to have some refreshments together, but i went to continue the walk around southwark that i had started before the blessing of the thames. i'd started my walk at london bridge station, going down great maze pond through the centre of guys hospital and on to long lane. years ago i wrote a walk leaflet of this part of bermondsey and sold several hundred copies, and it was interesting to visit a part of this again. one major redevelopment is the new tabard square by berkeley homes and architects rolfe judd, now largely finished. the three lower buildings, the ellipse in long lane, sterry street and tabard street, are more interesting the the average development, although i was less impressed by the 22 storey tower. there are also a number of minor changes, but it was good to see some of the buildings i'd mentioned in the leaflet still there, in particular Harding & Sons in Tabard St.
hackney wick remains one of the more interesting areas of london, and i took a few pictures despite the light rain on my rather meandering way to the manor gardens allotments off waterden road. the manor gardens allotments were another of the charitable provisions that came out of the link with eton college and the eton college mission set up in hackney wick. arthur villiers was one of four old etonians (the others were gerald wellesley, founder of the eton manor old boys club for over 18s, alfred wagg and sir edward cadogan) who in 1924 set up a charitable trust to keep the clubs running. villiers, who was a director of barings bank, had previously in around 1900 provided the manor gardens allotments on an adjoining site as a means of providing both healthy exercise as well as suitable nutrition for the young men of the are. the land was provided for the community to use in perpetuity. 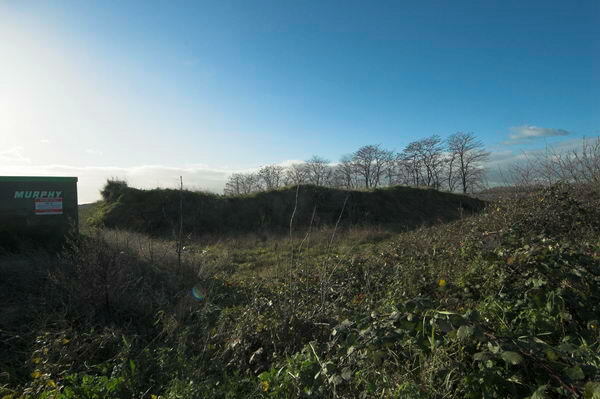 since then it has continued in use, with a short break when the area was used for a wartime gun battery. at least a couple of the allotment 'sheds' are heavy concrete structures left over from this use. over the years it has been a thriving community of cultivators, recovering in recent years from some slight loss of interest, with the current renewal of interest in green and healthy living and eating. 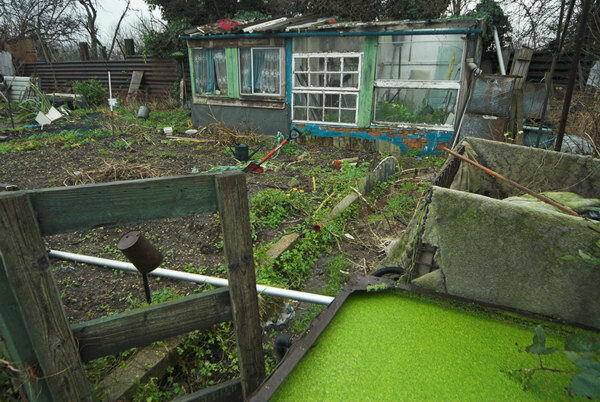 then came the london bid for the 2012 olympics, which put the allotments within the site. it could have been seen as a golden opportunity to give the games some green credibility behind the lip-service the bid gave to biodiversity and sustainability, and certainly as a committment to the post-2012 legacy of the games - to leave sites such as manor gardens and the adjoining nature reserve as a green centerpiece to the site. unfortunately the architects and developers seem hell-bent to create a brown Olympics, creating an irredeemably distressed site that will only be economically recoverable when all the concrete has crumbled. the new year feast was an open day at manor garden allotments, inviting the public and press to see the site and the 80 plots for themselves. 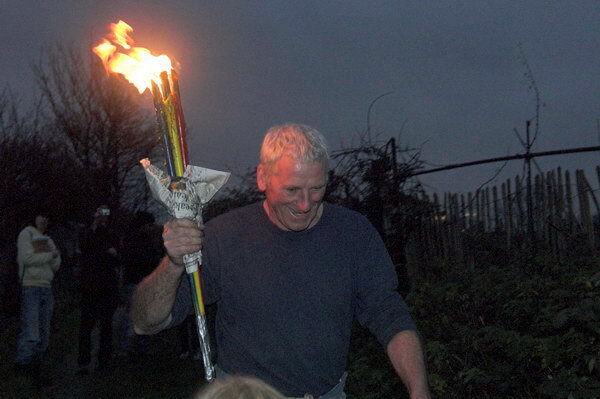 a rather low-tech 'olympic torch' was carried across the bridge to the site and used to start a bonfire. 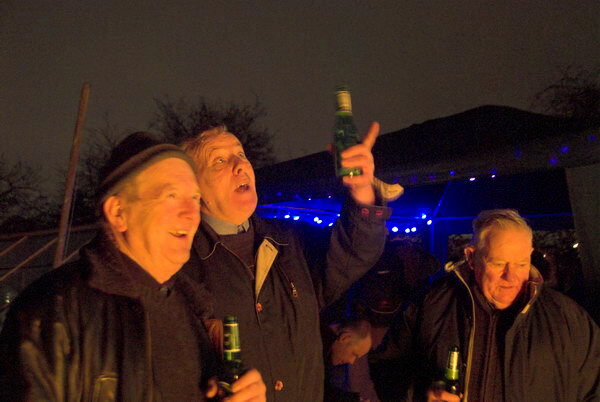 then we had a party around it, with a couple of speeches and some tasty refreshments. 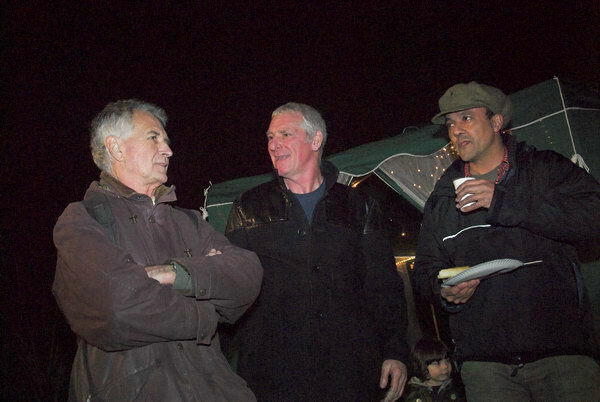 there was support from some celebrities, as well as the opportunity to meet some of the plot-holders, some of whom have raised crops here since the 1940s - and those whose parents had plots in the 1920s. there are also many newer tenants, very much reflecting the multicultural nature of the surrounding area. it would be a great shame to lose this splendid facility for four weeks of use in 2012, when it could easily be built around. it isn't in a critical area but will simply be under concrete as a footpath, and probably also the site of a huge advertising 'scoreboard' for the games sponsor. what will it say about the 2012 Olympics for a site that is currently a beacon for healthy green eating to be selling big macs? the planning application is submitted on 1 feb, with eviction expected on 2 April 2007. it is unlikely that the replacement site offered at marsh lane can be ready before 2008. hopes are not high, but it would certainly be a great green miracle if the allotments survive. friday was the opening night of 'another london' with pictures from this project along with work by paul baldesare and mike seaborne. you can see the online version of the show, but fortunately can't hear my speech. the show continues at kingston museum until march 3, 2007. we had around 100 people there for the opening, and everyone was more than necessarily positive about the work. the designers of the section of the london loop walk section between chigwell and harold wood clearly had a single aim in mind, to plunge walkers into the deepest mud they could engineer. 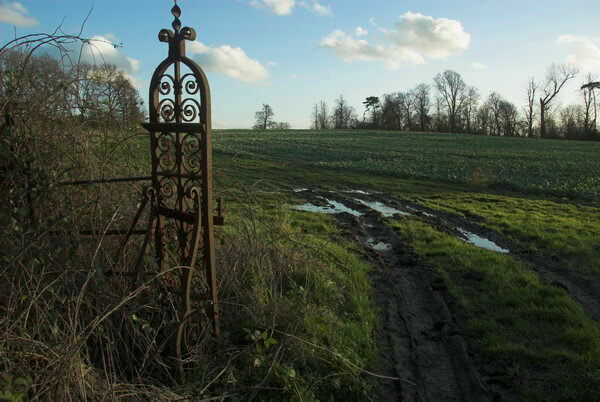 at times the route eschews long-established paths to make detours along newly established permissive paths clearly chosen for taking the walker through rivers of mud along field edges, tracks and gates where beasts churn clay and water to create a deep sucking morass. at one point, a jcb had got in on the act as well. boots were not enough to tackle this section; waders would have been more up to the job in various places, as we struggled through, grabbing at fences. we became adept at clutching at the wires between the barbs as we stopped ourselves slipping down, but it was slow and heavy going. of course at this time of year fields are often muddy, but traditional paths tend to avoid the worst of it, and it was mainly the new sections of the loop that were near impassable, apart from one bridleway that was obviously well-trafficked by horses from local riding schools - and where mud and water where both largely euphemisms. of course horses have a right to use bridleways and green roads, so too do walkers and cyclists. however there are some places where better provision is needed to allow mixed use, and others where the trackway might usefully be divided to keep horses to one side. usually those places selected by mapmakers and writers of guides for their views disappoint, and this was the case today. being able to see a long way doesn't generally make for a good view. although overall the view from the track up to where we entered havering park was dreary, along the horizon we could see laid out all the taller buildings of london: the dome, canary wharf, the gherkin, nat west tower, london eye, post-office tower and many more. i took a series of exposures through a long telephoto to produce a panorama. dusk was falling as we arrived at harold hill, probably as well although the path hides much of it by making its way along the ingrebourne. burberry clothing sells on its british quality, and the treorchy factory has been making its garments for 20 years. the management has decided to close the factory, throwing its 280 workers out of work. their garments will be made instead in asia, under sweat-shop conditions. the savings to burberry will be made at the expense of workers in the uk who lose their jobs, but also by exploiting the workers who will produce them abroad. chinese workers have no unions and work under repressive labour laws, little regard for safe working conditions, long hours and lousy low pay. workers from treorchy in south wales were in london on saturday 27 january to demonstrate outside the bond st and regent st burberry shops. they were supported by a team from 'no sweat', "an activist, campaigning organisation, fighting sweatshop bosses, in solidarity with workers, worldwide", dressed as removal men, who attempted to wrap the shops and workers in brown paper and ship them, second class, to china. police made the demonstrators remove posters from the windows but otherwise stood and watched. some were obviously amused by the removal men, and some also made clear their sympathy with the welsh workers. i don't much like bond street and the west end, and never feel comfortable there. walking back to picadilly and leicester square i found it more interesting to look up than take much notice of the nonsense at street level. 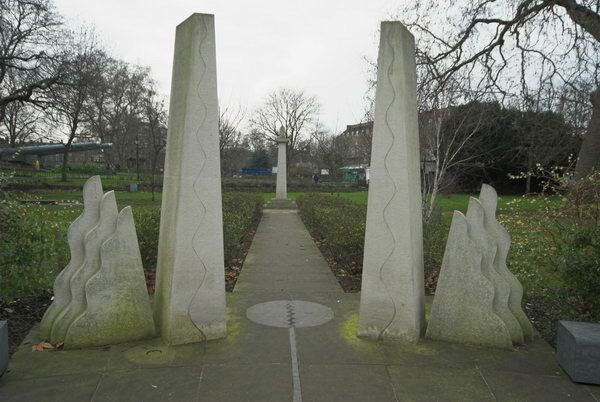 one of the many events around the capital to mark holocaust memorial day was a wreath laying at the soviet war memorial in geraldine mary harmsworth park, which surrounds the imperial war museum that houses a moving exhibition on the holocaust. next to the soviet memorial is a small tree planted in 2002 to commemorate the victims of the holocaust. i wasn't able to be there for the ceremony, but went later in the day to photograph the two memorials, as well as the tibetan peace garden in the park, opened in summer 1999 by the dalai lama. it seemed an appropriate place to sit and reflect for a while. every year the king's army, part of the english civil war society is one of two bodies that remembers the execution of king charles i in 1649, by a march and parade through central london, starting in the mall, just down the road from buck palace, and passing through the horse guard's arch onto whitehall, where a parade is held in horseguards avenue at the side of the banqueting house where the king was executed. 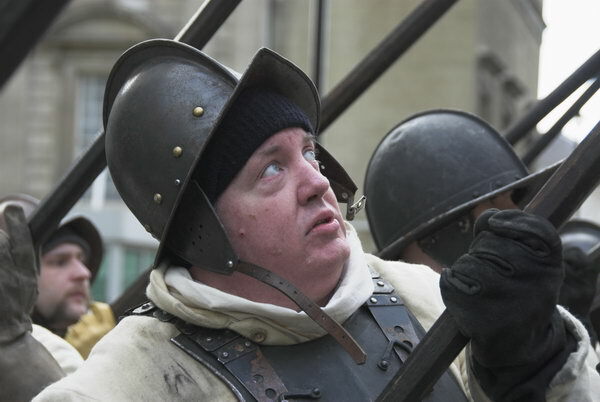 the kings army is the only civil association allowed to march through the horse guards's arch, and also the only body allowed to march carrying guns - fully working smooth-bore muzzles-loading muskets through central london. with my republican sympathies, the execution seems to be perhaps the only occasion in british history that displays a sensible attitude to royalty, and i'd be happy to celebrate thst, along with the roundhead association, the other half of the civil war society, but they don't take part in the commemoration. i left during the parade for a leisurely lunch then went looking for a demonstration at the foreign office against the fradulent mexican "president" felipe calderon, but both he and the demonstration failed to materialise (it did happen the following day, but i was busy elsewhere), although barbara tucker and a friend were standing outside downing street and talking to passing tourists. 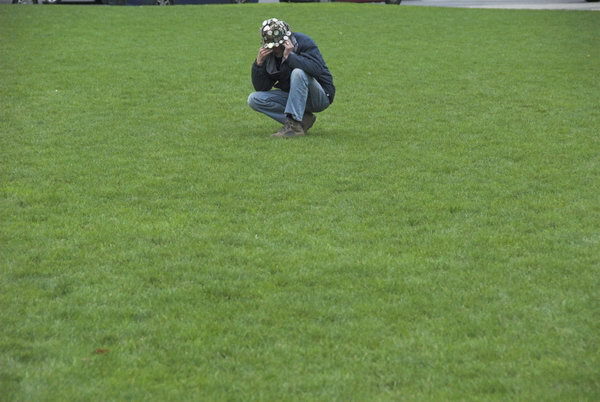 so i made a brief call to parliament square, hoping to have a quick word with brian haw, who i'd not seen since his court victory on 22 jan, when the judge ruled he had not breached the conditions imposed on him as they were both unclear and also invalid. every year, on ashura, the tenth day of muharram, shiite muslims celebrate the life and ideals of imam husain, the grandson of the prophet, and mourn his martyrdom at karbala in iraq in 61 ah (ad680.) those on the procession seek husain's blessing on their daily lives. his example in dying for human dignity, human rights and the aims of his faith inspire them in trying to live a good and moral life. several thousand people joined in the annual procession in london, making their way slowly from hyde park to the mosque in notting hill. 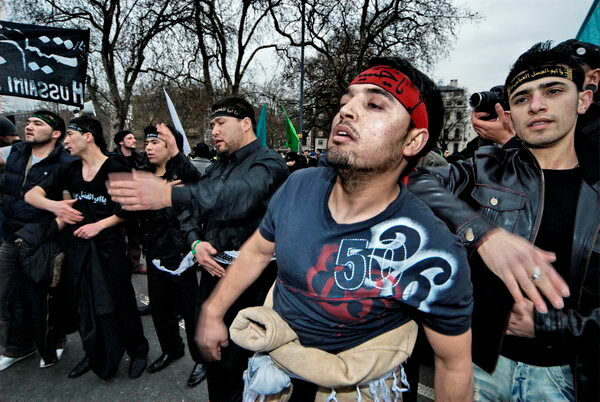 many wore black, and all joined in the chanting of "ya husain" accompanied by the beating of drums clashing of sanj (cymbals) and the blowing of trumpets, along with calls to prayer. those taking part beat their breasts, largely in a symbolic fashion, although there were groups of young men who from time to time swung their arms vigorously. 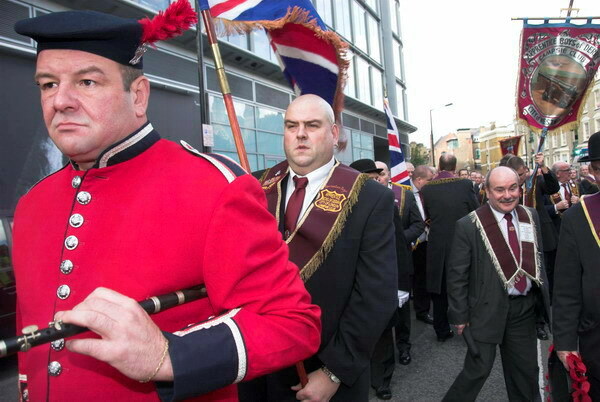 by the time the end of the procession had reached lancaster gate (it was moving at a speed that would not have embarrassed a snail) it was almost time for me to go and i needed a rest. so i went into kensington gardens and enjoyed the italian gardens there. Brian Haw and supporters continue the protest against the killing in Iraq and elsewhere. 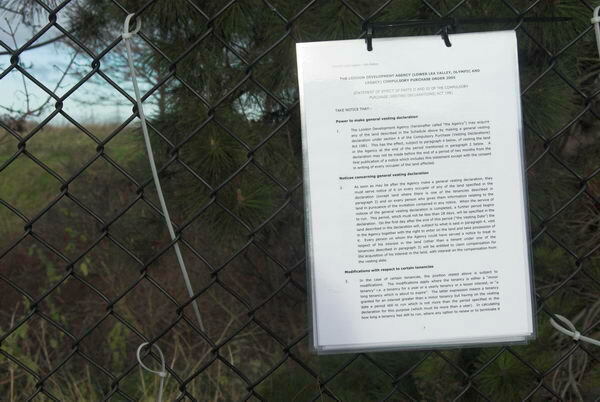 Notice about compulsory purchase on fence at Clays Lane. Canary Wharf seen from Bow Back Rivers. 'American guard', 'Prisoners', Police and Embassy. 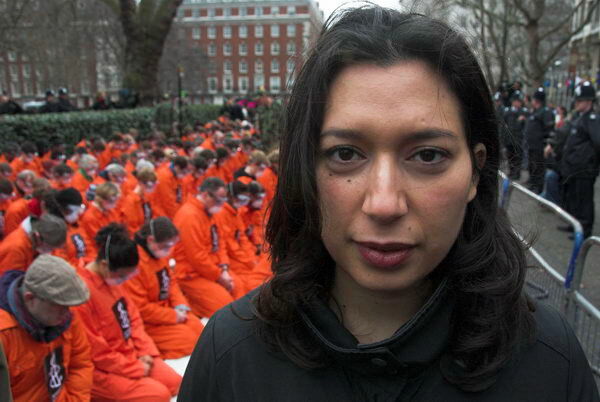 Amani Daghayes, sister of Guantamo captive Oscar Deghayes, a British resident. 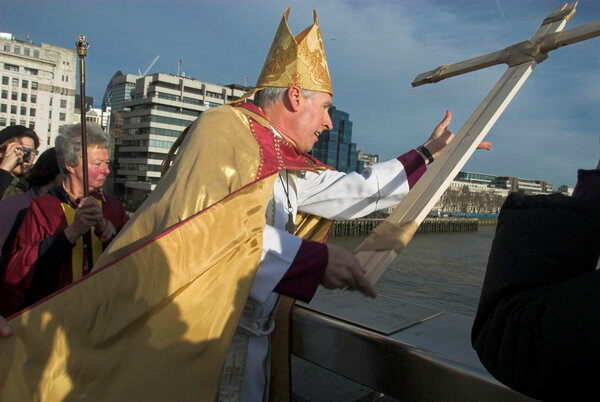 The Bishop of Woolwich throws a wooden cross into the River Thames to bless the waters. 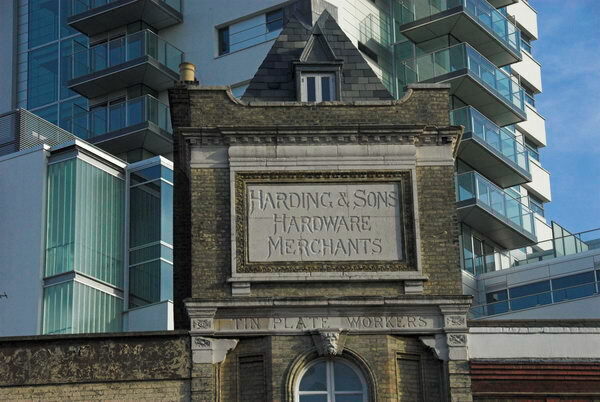 Harding & Sons in front of the Tabard Square 22 storey tower. 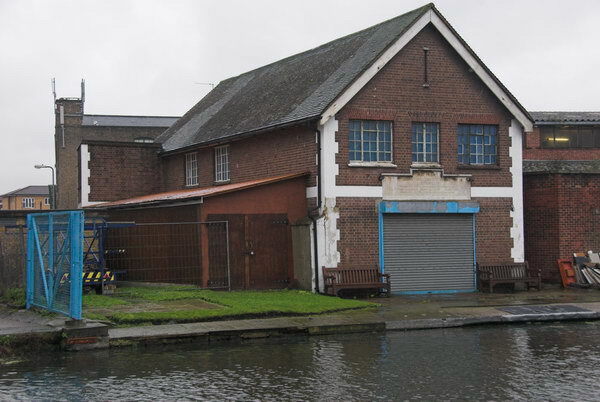 Johnstone Boathouse, Eton Mission Rowing Club, 1934. Plot holders by the bonfire. Pyrgo Park gate post, London Loop near Havering-atte-Bower. No Sweat outside Burberry shop in Regent St, London. Ballet at the back of the National Gallery. Tibetan Peace Garden, Geraldine Mary Harmsworth Park, Lambeth. 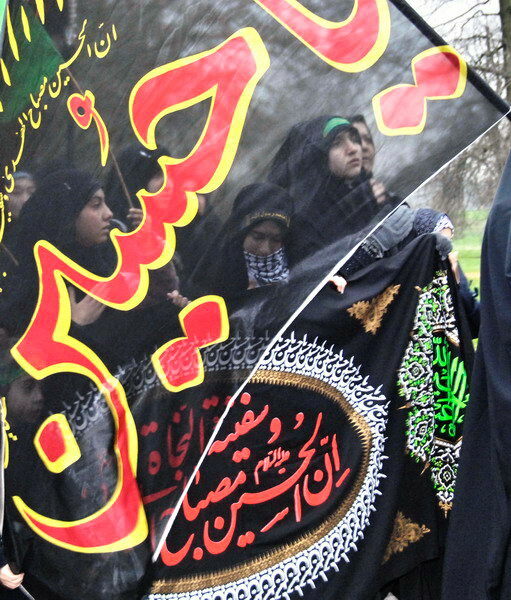 Shiite women in the Ashura Day procession, London. The Italian Gardens as dusk falls on a dull London afternoon.